Cultural City Almora, a hill station fully developed by Indians situated pretty above 6000 feet on a crescent shaped mountain, is in the Kumaon mountains of the Himalayas in Uttarakhand State in India. It is assumed that Almora has a long history and has existed since the Vedic Age. This is a crowded hill town in North India and is highly attractive for the astounding natural beauty.Almora is a town of temples, with temple of Goddess Nanda Devi placed in the centre of the town. The mountain, the undulated terrains with greenish luxury all around, is visible from the nearby areas as well.Almora is situated in the midst of the Himalayas, the king of mountains and abode of the gods. From time immemorial people have visited this region for peace, solitude and liberation of the soul. Places to Visit in Almora for tourists Attractions are many But the famous Almora Attractions are : Bright End Corner, Martola, Kalimutt, Deer Park, Govind Ballabh Pant Museum,Simtola, Katarmal, Chitai Temple, Kasar Devi Temple, Nanda Devi Temple to name the few. Majorly the tourism activities in Almora include -To know about the must see Tourist places in Almora -Uttarakhand,use the information below. 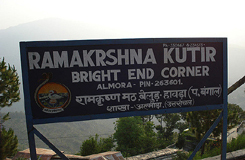 It is situated 2km form Almora. This site is famous for picturesque sunset and sunrise seen through the Himalayan peaks. There is a library named after Vivekananda which has numerous books on literature and teachings. 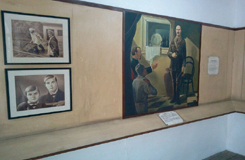 You can also visit Vivekananda Memorial where Swami Vivekananda had stopped for a while on his journey to the Himalayas. It is an ideal spot for picnicking situated amidst lush green gardens. Situated 10kms from Almora, Martola is inhabited mostly with foreigners. Buses and taxis are available up to Panuwanaula and one has to cover the remaining distance on foot. 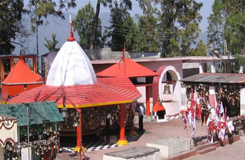 It is a scenic spot dedicated to Goddess Kali, situated at a distance of 5kms from Almora. The views of the snow capped Himalayan peaks are invigorating from here. 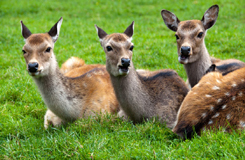 Deer Park is situated just 3km from Almora. Deer Park comes in NTD (Narayan Tiwari Dewai). This museum is situated opposite to the bus stand. The museum remains closed on Mondays and other Government Holidays. It is open from 10:30 A.M. to 4:30 P.M. The ravishing views of the mountains covered with pine and deodar trees are enchanting from Simtola. 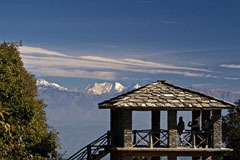 Simtola is a popular spot for camping and picnicking and it is situated 3km from Almora. It is the second most important temple to Sun God, the first one being Sun Temple of Konark in Orissa. Katarmal is more than 800years old. 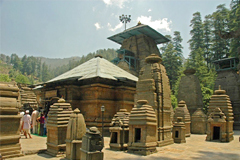 Situated 7km from Almora this historical important temple is an example of intricate sculpturing. 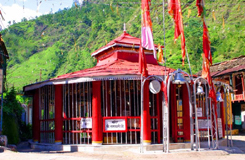 Chitai Temple is dedicated to Gollu Devta, an incarnation of Gaur Bhairav. Situated 8kms from Almora the deity of this sacred temple is reputed to make every wish come true, provided the worshipper ask for it with a clear conscience. All he asks for in propitiation is a bell, as was evident from the thousands of bells strung across the temple premises. Anyone can even seek Gollu Devta"s divine intervention by writing to him. Stacks of letter are pinned all over the temple along with bells. 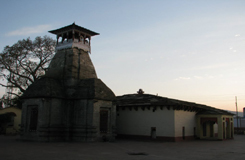 The ancient temple of Nada Devi is one of the prime attractions of Almora. Nada Devi is the patron goddess of the local people and the erstwhile Chand dynasty. Hundreds of years old, this temple carries deep faith of people from this area. The statues and images on the walls of the temple are intricately carved with great skill. 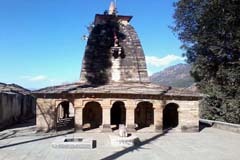 A popular cave temple of Lord Shiva, Gananath is situated near Satrali village (Takula) at a height of 2116 m above sea level. The temple is at a distance of around 47 km from Almora and is thronged by people during the fair held on the occasion of Kartik Purnima. The heart of almora city is its local market also known as Almora bazar, Almora bazaar is an interesting market spreaded around 1.5 kms with no vehicles available in the market, one has to shop walking in the market. The Almora bazar is floored by stone slabs (Pataal). 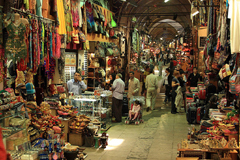 The Almora bazar is divided in various sections according to the people living in the market and kind of speciality they offer. 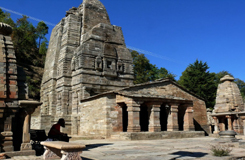 Patal Devi Temple (Village Shail, Almora) temple is about 200 years old and is at a very beautiful location in village Shail, Almora. 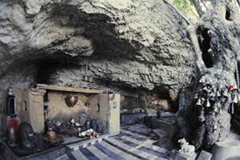 There are 4 natural water sources around the temple. 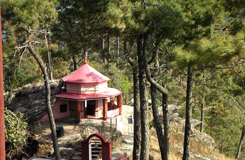 Another interesting place just outside Almora is the temple of Patal Devi. It's an ancient devi temple which was last reconstructed in the 18th century. In the premises of the wildlife sanctuary is the zero point from which one can look across 300 kms to view Kedarnath, Shivling, Trishul and Nanda Devi. You have to walk inside the sanctuary for a kilometer and half to reach to the point. 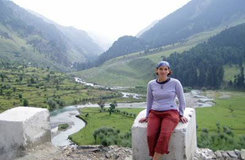 A guided trek upto Zero Point is the most recommended way to explore the green beauty of the Wildlife sanctuary. 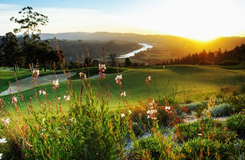 There are plenty of things to see in almora, and one can choose from range of activities available or things to do in almora which can be a walk in the green forests areas, adventure treks. 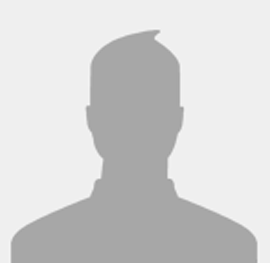 If you looking for detailed information on Almora,Almora attractions,Almora tourist attractions,Almora sightseeing,almora places to see, places to visit in Almora,Tourist Places in Almora,places of tourist interest in Almora,must see places in Almora,visit Almora,Almora tourist spots,best places to visit Almora,things to see in Almora,places of tourist interest in Almora,places in around Almora,things to do Almora,local sightseeing in Almora,what to see in Almora,Martola,Kalimath,bright end corner,kalimath,deer park,simtola,katarmal,chitai temple,gobind ballabh pant museumgarhi,kasar devi temple,nanda devi temple,gananath temple,jageshwar temple,thana bazar,patal devi,zero point,allseasonsz.com,Almora uttarakhand, uttaranchal,india, your search ends at allseasonsz.com for the likings of all age groups.There are tourist places near by almora offering majestic views of Himalayan peaks.Allseasonsz.com Uttarakhand best travel agents required for making your almora trip memorable. 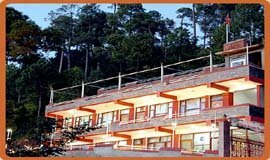 Whether it is about sightseeing around almora, almora excursions, almora places to visit, tourist attractions around almora-Allseasonsz.com Uttarakhand is convenant to propose amazing almora Packages offers and deals for your tour.